Washington had an estimated population of 658,893 in 2014, making it the 22nd-most populous city in the United States. Commuters from the surrounding Maryland and Virginia suburbs raise the city’s population to more than one million during the workweek. 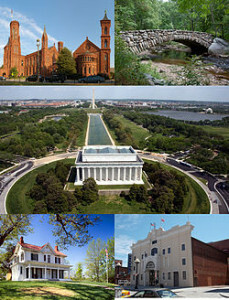 The Washington metropolitan area, of which the District is a part, has a population of over 6 million, the seventh-largest metropolitan statistical area in the country. A locally elected mayor and a 13‑member council have governed the District since 1973. However, the Congress maintains supreme authority over the city and may overturn local laws. D.C. residents elect a non-voting, at-largecongressional delegate to the U.S. House of Representatives, but the District has no representation in the U.S. Senate. The District receives three electoral votes in presidential elections as permitted by the Twenty-third Amendment to the United States Constitution, ratified in 1961.